“The Day Star” Cuff Bracelet. $725. SOLD. The Day Star is a guiding and protective spirit, one to honor and thank for the gift of the new day and renewed light. Wings summons small versions of this powerful cosmic entity into being with his latest cuff bracelet. The band is wrought of twelve-gauge sterling silver, thick enough to feel solid and substantial, but not so heavy as to weight down the wrist. The top of the band is bisected by opposing rows of chased stampwork, the inner rows meeting at the center to form Eyes of Spirit enclosing shimmering dawn stars, a powerful composite symbol of wisdom, illumination, protection, and guidance that chase the entire length of the band. The motifs of protection are reinforced by the rows of stampwork at either edge, each its own different repeating pattern of a stylized lodge symbol. At the center, set in a plain, low-profile bezel, rests a rectangular of brilliant, intensely-blue Sleeping Beauty turquoise, the surface high and free-form, textured with an unusual degree of bold black matrix. The band is buffed to a shade or two off Florentine, like the subtle glow of the stars at dawn. 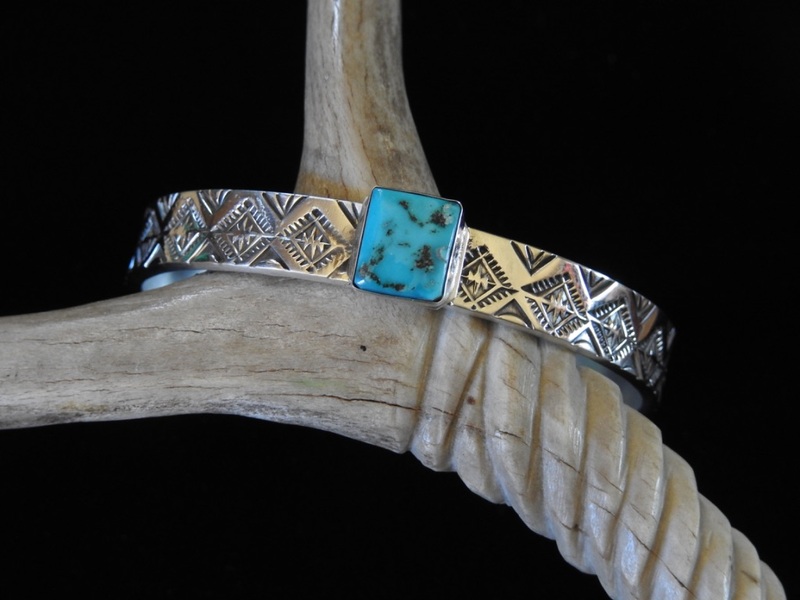 Cuff is 6″ long by 5/16″ across; cabochon is 3/8″ high by 7/16″ across dimensions approximate). Posted on Friday, November 9th, 2018 at 2:03 pm. Filed under: Bracelets, Cuffs and Links and Bangles	RSS 2.0 feed.